QualCampus-College is designed and developed by a class of technical and management professionals at Qualsoft after consultations with various colleges’ heads and educationists exclusively to fulfill each and every need of the colleges. Cloud eCollege includes various modules that will automate each and every process of the institute. The software is very user friendly and simple to operate. Qualsoft Systems Pvt Ltd, is an IT Solution provider specializing in Customized ERP Solutions, Web Solutions, Business Intelligence, Mobile apps, Digital Marketing Solutions and more. Keeping pace with the latest technology, Qualsoft provides innovative solutions to its clients using the new generation technologies such as Mobility, Cloud, E-commerce, and Digital Services. Manage all types of Fees. Minimum and Maximum Marks Master. Provision for Automatic Application of Grace. 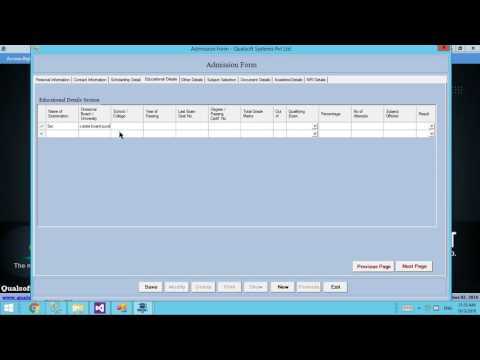 Employee’s Personal Information with unique ID. Salary details with Pay Scale. Pay Slip / Salary Certificate. PF Loans and advances & Arrears. Automatic/Manual Employee Attendance & Leaves. Manage Record of Professional Tax / Provident Fund / Income Tax / LIC /TA. Manage Proforma No: 2 & 5. New Books Purchase with Barcode Support. Manage all types of Scholarship. Generate Claim/Grant Allotted/Quarterly scholarship Report. Roll No & Class Allocation.